I've been on a "greens" kick lately and after the Collard Green Recipe was a success dad mentioned that he had never had mustard greens before and neither had I. So I decided to look into it and find something that sounded at least halfway decent. I'm sorry, I really don't cook my greens with ham hocks, salt pork, fatback or smoked turkey legs because I can't stomach the 2 weeks worth of sodium intake that using such meats adds to the recipe. I do, however, like using bacon and after digging up the collard greens recipe last week I found out using bacon is Creole Style. Excellent, I love anything having to do with New Orleans having spent time there back in the 90's so the search was on. I didn't have to look far before I found a recipe on the Cut 'n Clean Website. We don't seem to have that brand around here but I used Glory Mustard Greens which were fine once the stems were picked out. Toast pecans on a cookie sheet in a 350-degree oven for 5 or so minutes. Remove from oven and set aside. Turn oven off. Rinse mustard greens, drain in a colander and place in a microwave-safe container with a lid. Micro cook on high for about 7 minutes, stirring once halfway through. Remove from oven and set aside. Meanwhile, in a 12-inch non-stick skillet or wok over medium heat, cook bacon until crispy, about 5 minutes. Remove bacon from pan and lay on a paper towel. When cool, crumble and reserve. Add olive oil to the bacon drippings in the skillet and heat. Add onion and sauté over medium heat for 5-7 minutes, until softened, stirring occasionally. Add garlic and sauté for an additional minute. To the garlic-onion mixture, add chicken stock, Creole mustard, honey, Creole spice mix and vinegar. Add cooked mustard greens and stir to mix well. Reduce heat to low, cover and cook for 6-7 minutes more, until leaves are tender. 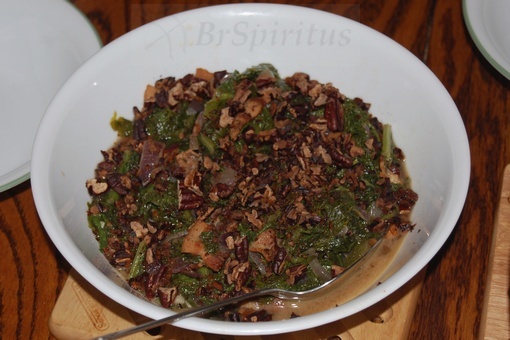 Garnish with crumbled bacon and chopped pecans. See That? "Nutritional Grade 'A'"